Two of the most important players in the mobile industry, Verizon and Motorola, have essentially called Windows Phone 7 a failure, with a Verizon exec going so far as saying that the Nokia deal won't help the struggling smartphone platform. This is clearly not what Microsoft hoped for when it launched Windows Phone 7 to great fanfare late last year. I do want a strong third OS out there. It gives the carriers more flexibility and balances the interests of all the parties. But I still have doubts whether Microsoft will get the traction they are hoping for with Windows Phone 7. If you look at our device pipeline for 2011, we have very strong relationships with LG, Samsung, Motorola, HTC, and now Apple. So I think it would take a really compelling device from Nokia or any new vendor to break in. It doesn't mean that it can't happen, but it would have to be really good. There were a bunch of things that we believed about Microsoft that ended up not being true, mostly about what functionality it would have in what period of time. We would like an opportunity to create unique value and we don't feel we could with a closed platform. Clearly, Microsoft still has an uphill struggle with Windows Phone 7. And Verizon being underwhelmed by the Nokia arrangement doesn't help either. 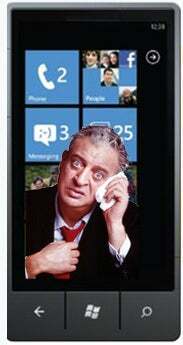 Still, the deal with Nokia is the best attempt by Microsoft to help its struggling smartphone platform. If Verizon is to be believed, it won't be enough, but only time will tell. This story, "Verizon and Motorola Execs Give Thumbs-down to Windows Phone 7" was originally published by Computerworld.